WHO IS Bali Children Foundation? Our vision at Bali Children Foundation is to provide an educational pathway for disadvantaged Balinese children – a journey leading to growth and long term sustainability. YOGA CAMP NEED YOUR HELP? 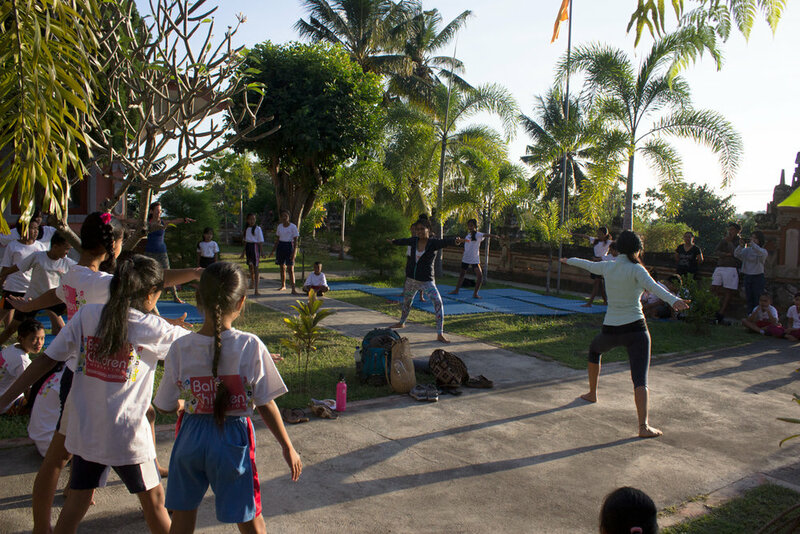 Let's Imagine has organized FREE yoga camp for youth who are sponsored by Bali Children Foundation in Lovina, North Bali. The yoga camps are currently running approximately every sixty days. Ultimately to keep this program running, Let's Imagine is also looking for passionate Volunteer Yoga Teachers to lead one or more Yoga Camps. We encourage Yoga Teachers located in Bali to apply for this position. Are you interested in helping Let's Imagine create this program through dedicated volunteer work? We are calling all educators in Bali and around the world who are passionate about volunteering their time, traveling, and taking on the leadership role as a genuine yoga teacher. If you can imagine yourself volunteering at Yoga Camp, please do not hesitate to email us. SUBJECT: "I CAN Imagine myself VOLUNTEERING FOR YOGA CAMP"
Please contact us if you are interested in volunteering at our future yoga camps!